Thanks go first and foremost to Chief Leader Colin Nicol, whose commitment to a meaningful science program, support and energy were critical. Secondly, to the staff of Gane and Marshall, both in the office and the field. They put in long, hard days to support the logistics of the expedition. I would particularly like to thank Sam for loan of a laptop in the field; and Gabriel, driver by day and mechanic by night, and whose efforts were unstinting. Dr. Roger Hipkin of Edinburgh University’s Department of Geology and Geophysics was instrumental to this project: loaning the gravimeter and giving up his time before and after the expedition to provide help and advice. Dr. Ed King of the British Antarctic Survey lent the seismometers and associated equipment to the expedition and gave up his time beforehand to explain the use of the equipment and to prepare it for use. He then spent a lot of time on the end of a satellite phone trying to help us get the equipment to work in Tanzania. The failure to deploy the equipment was due to my ignorance and not in any way to a lack of commitment from Ed. The ideas, advice and enthusiasm that Drs. Roger Clark and Graeme Stuart of Leeds University’s School of Earth Sciences provided were invaluable. None of the gravity work would have been possible without the expertise and enthusiasm of Hugh Anderson and the equipment provided to him by Leica Geosystems. Hugh provided accurate location of survey points and analysis of the navigation data and was a vital and integrated part of the Geoscience program. This was not a particularly accessible science project but the YEs of the Geoscience and Survey fires stuck at it, were patient in using a notoriously fiddly piece of science field equipment and sweated to carry heavy loads over difficult terrain. Every single member of the fires deserves credit for their efforts; but I would like to mention two groups of people in particular: Hannah, Megan and Vanechka, who volunteered to carry out the gravity profile of Ol Doinyo Lengai; and Angharad, Will B and Will C who scrambled up a difficult ridge with the equipment to obtain data from the Serengeti Plateau. To my knowledge this is the first time this has been attempted, and each survey involved carrying heavy and unwieldy science equipment up steep terrain during the night, and then surveying during the following day. Finally, thanks go to my long-suffering co-leader and tent companion Sue Block, who organised, carried, sympathised and encouraged way beyond the call of duty. Ebinger, C. et al. 1997. Rifting Archaean lithosphere: the Eyasi-Manyara-Natron rifts, East Africa. Journal of the Geological Society, London. Vol 154, pp 947-960. Foster, A.N. et al. 1997 Tectonic development of the northern Tanzania sector of the East African Rift system. Journal of the Geological Society, London. Vol 154, pp 689-700. The following equipment was used for the gravity survey. Lacoste-Romberg Gravimeter, base plate, power leads, connectors, spares and tools. 12V dry-cell or gel batteries for power while surveying or in air transit. 12V lead-acid car batteries for power at base camp, or in vehicle transit. Battery chargers for the above. Generator, fuel, oil, spares and tools to power battery chargers. Two differential GPS receivers, with associated tripods, data-loggers, batteries, battery chargers, connectors. Laptop computer for data reduction, mouse, power supply, spare batteries and 240V a.c. and 12V d.c. battery chargers, flash memory sticks for backing up data and swapping data between computers. Redundancy here is a very good idea. String and level for estimating terrain corrections. Every expedition includes things that work well and things that work less well, and Tanzania 2004 was no exception. The points below may be of value to those planning future expeditions. Field experience confirmed the preconception that a traditional geological mapping project would have been very challenging; with outcrops widely spaced, difficult to access and difficult to interpret. The decision to use geophysical techniques was sensible. However geophysical techniques are harder to explain in the field, and results less intuitive than a geological map; and the resultant project ended up inspiring the YEs less that it could have done. The logistics of gravity surveying during the crossing of the Rift Valley proved to be a challenge. The need to have two GPS receivers working simultaneously several kilometres apart, and lack of reliable radio communications meant that it was impossible to carry out the gravity survey at the same pace as the expedition moved. The twelve-hour equatorial day meant that working late to catch up was not an option. The two-night stays in some campsites it gave the gravity survey the opportunity to catch up. As soon as the expedition established a permanent base at Lengai, both the problems above disappeared: radio communications on the volcano were much better, and with one GPS receiver fixed at base camp, the other could be moved at will. Pre-expedition fears that the terrain would preclude gravity fieldwork proved needless: the energy and determination of the YEs overcame the terrain. Supporting a constant presence on the summit while simultaneously running a science program from the base-camp was a challenge as every summit trip involved missing a night’s sleep. The biggest single failure was the inability to deploy the seismometers in the field. The seismometers and controls worked fine but the computer interface did not. This had worked fine in pre-expedition tests at BAS on a computer with a Windows 95 operating system, but did not work in Tanzania with Windows NT. The root cause was insufficient familiarisation time at BAS. Much of the day at BAS was spent setting up the links between the seismometers, the data loggers and the hard disks; and fixing problems. Only towards the end of the day was the computer interface examined and we didn’t acknowledge the potential for problems that would be encountered switching from Windows 95 to Windows NT. The Geoscience program for this expedition was deliberately more dependent upon technology than is traditional with BSES. The gravimeter is a tried-and-tested field survey instrument and worked perfectly. Gravity field data reduction can be done by hand or post-expedition, but spreadsheet analysis in the field was preferred to ensure that the results being obtained were meaningful, and to demonstrate the results to the YEs. One laptop computer broke two days before the expedition was due to depart. The (brand new) replacement suffered a failure of the power supply five days into the expedition. Fortunately Hugh had a laptop for the survey project and he was generous enough to allow it to be used for the gravity data analysis. This was made possible because of compatible operating systems and multiple ways for storing and transferring data between computers (CDs, memory sticks). The normal limitation with digital photography is lack of camera memory. Photos were transferred to a laptop which solved the memory issue and permitted slideshows to take place in the evenings, events which were enjoyed by many expeditioners. The science program was conceived in the knowledge that vehicle support and power were going to be available. 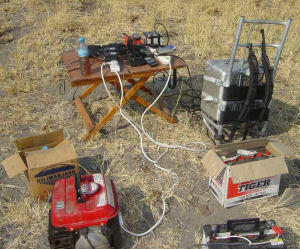 A 2-stroke petrol generator was used to supply power at campsites, and 12V car batteries were used to supply power on the move, and meant that the generator was not required at every stop. The back-up plan should the generator have failed was to use the vehicles to recharge the 12V car batteries, but this was never required. A combination of 12V and 240V adaptors for laptops and cameras, together with spare rechargeable batteries, provided redundancy and ensured that that whatever power supply was available at a particular time, it could be used. Recharging electrical equipment at Lengai base camp. The science program was designed in the knowledge that vehicle support was going to be available.